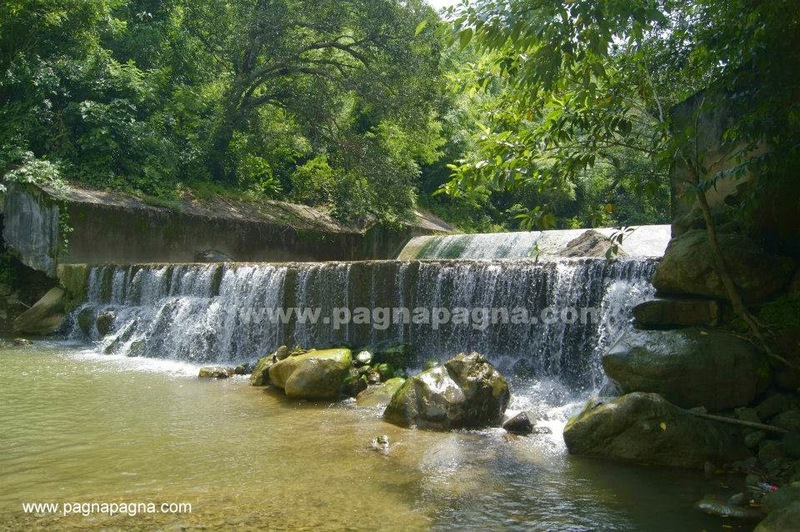 "I headed to south La Union and saw Macabato Falls for the second time. As a bonus, I get to explore the other areas nearby that some locals visit"
I stepped down from the mini-bus at "Elpidio Quirino stone monument" in barangay Gana, Caba, La Union (8:33 am). There I rode a tricycle that went eastward passing by barangay Juan Cartas (8:41 am), barangay San Jose and into the side of a river (8:54 am). All of those barangay is still in the municipality of Caba. At the river was a bamboo raft that conveys people to the other side which is part of the municipality of Aringay but their was no navigator around. A tricycle driver resting at a makeshift shed said "Ikkatemon ta sapatos mo ta ballasiwemmon ta karayan" (Just remove your shoes and cross the river) which i did. Anyway, the river was just below the knee deep and the flow was not that fierce. I put back my shoes on and continued walking on a muddy road at the other side of the river. 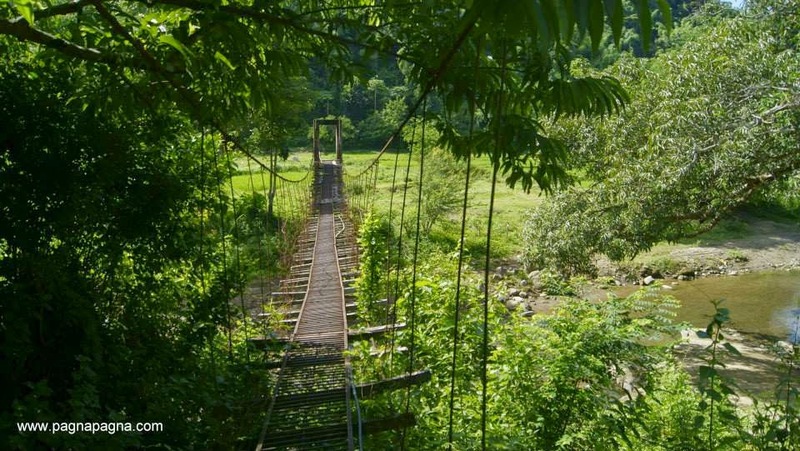 Walked further, walked on an old hanging bridge, passed by a small rice field and reached a concrete open-top irrigation canal. There it was, slightly hidden from rocks and foliage was the "Macabato Falls". I talked to a man who happened to passed by walking on top of the concreted wall of the irrigation canal. 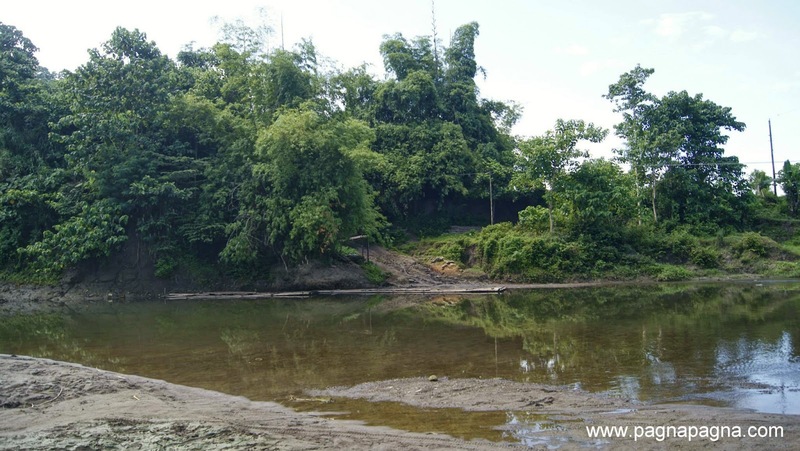 He said that there is also a place at the source of the irrigation canal nearby where some of the locals usually visit to swim. Well, that was great to know, it became my next agenda after I'm done with "Macabato Falls". 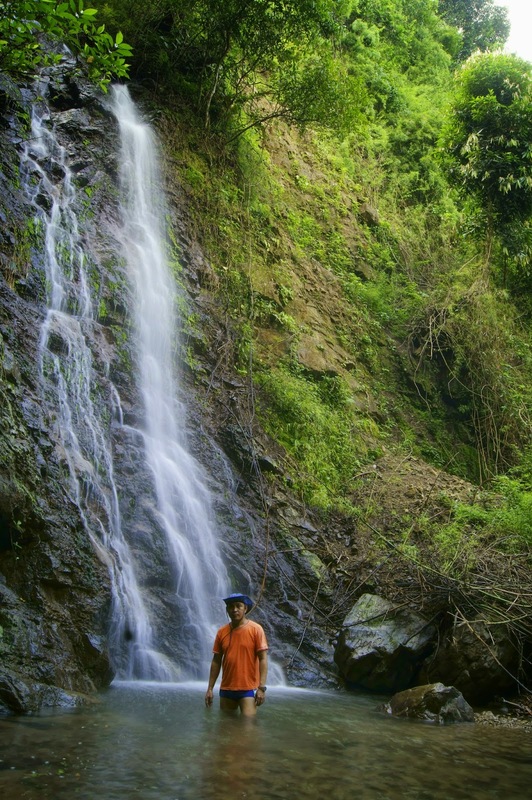 I climbed a few rocks to see Macabato Falls' main cascade (generally, the rocks were slippery). The cascade was thin and has a very shallow pool base. Surely, this waterfall completely dries-up during summer. After a while, I went down from the waterfall (9:58 am) and walked on top of the irrigation canal's concrete wall to go see it at source. I finally arrived at the source (10:13 am). It was a river and on it was an irrigation dam where kids where swimming. I took some photographs and videos of the irrigation dam and after that, I went farther upstream (10:30 am) to see if there might be an interesting part of the river. Little bit frustrated, I was about to get back when i saw the man i talked to earlier on his way back, walking on the trail along the river. He then said to me "ediay man dyay ibagbagak" (Over there was what I am telling you), pointing just upstream and referring to what he said that locals usually visit. I thanked him and eagerly, i went to see. The man I have talked to with some flat stones at his shoulder. He said he will be using them for his chickens. 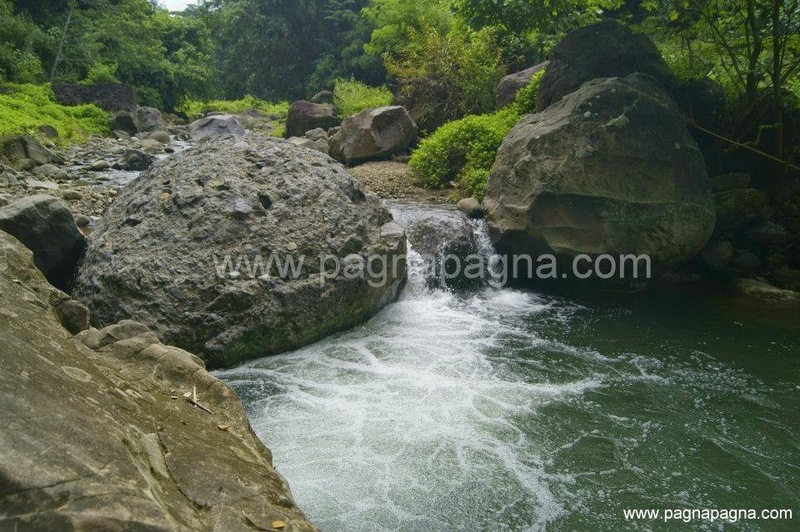 It was a natural "swimming pool" area along the river where a short-low cascades flows to it. From what I've seen, it looked quite deep. After lingering there for a while, i went back (10:56 am). I passed by the irrigation dam (11:07 am) and continued walking on top of the concrete wall of the irrigation canal. Along with me, on the trail, were the kids who went swimming. They were also going back to their homes. 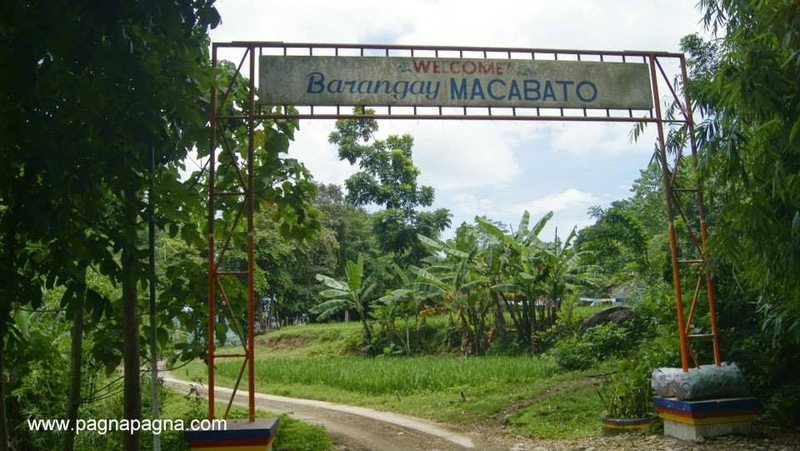 I asked them if it is better to walk to the Macabato Barangay proper (municipality of Aringay) than going back to where i came from at barangay San Jose, Caba, La Union. They said it is just okay to walk to the Macabato barangay proper than the later. I was adventurous and want to try that other way so they told me that i followed them going to Macabato barangay proper thinking that i can get a tricycle ride there going perhaps to Aringay town proper and it would be easier. 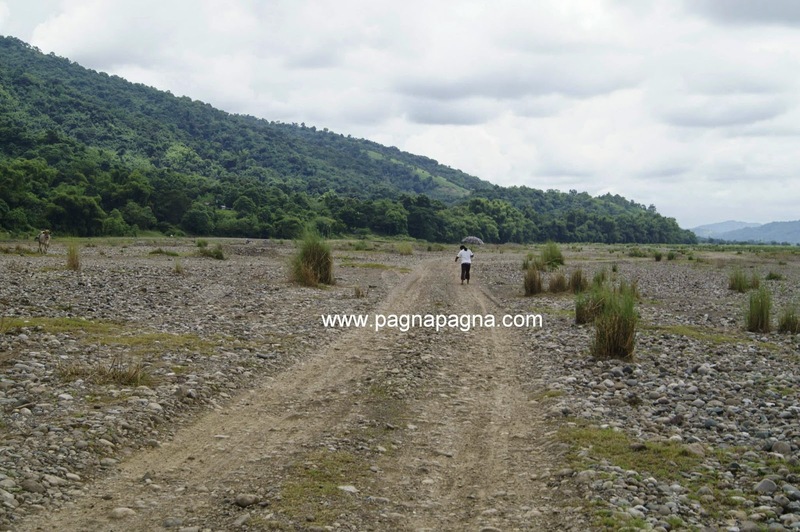 I was wrong, i walked continuously until i reached another riverside (around 12 noon). This time, i crossed the river on navigated bamboo raft and after which I continued walking on super-heated gravel carpeted riverside. 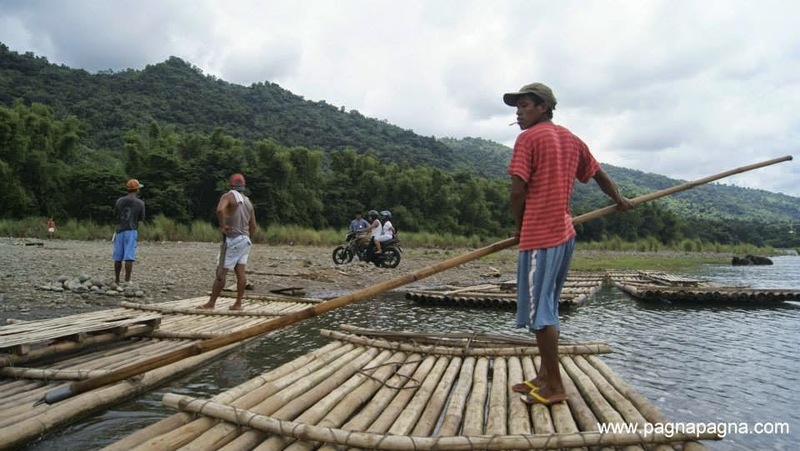 Crossing the river with navigated bamboo raft. As i continued walking, although it was gloomy that day, i still can feel the heat radiating from the gravel ground. After crossing the river with a bamboo raft, This is the hot graveled road. I reached the road at the residential area and walked further to an intersection (12:30 pm) where i saw a tricycle and rode on it back ride (there were two of us at the back of the driver and tricycles seem to be scarce in that area). I thought it was going to Aringay town proper but to my surprise, we went out to the national highway at barangay Sta. Rita East, Agoo, La Union (12:45 pm). Tired and hungry, I went to an eatery nearby. After which, it began to drizzle. Well, everything was good for i rode a mini-bus going back to Home Sweet Home.